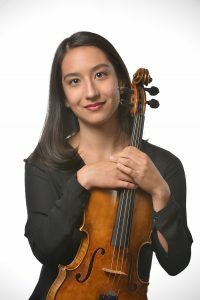 Violist Sarah Toy joined the Tucson Symphony Orchestra in 2015. Prior to this position, she was a member of the Canton Symphony Orchestra. In addition to her work as an orchestral player, Ms. Toy enjoys an active career as a chamber musician and educator. She has been featured as a musical guest on NPR’s Says You! and has performed with the Cleveland Chamber Music Society. She has collaborated with such artists as Boris Berman and former Principal Clarinetist of the Cleveland Orchestra Franklin Cohen. Ms. Toy received her Bachelor of Music and Master of Music degrees from the Cleveland Institute of Music, where she completed her studies under the tutelage of Jeffrey Irvine. Summer festivals include Spoleto Festival USA, Norfolk Chamber Music Festival, and the Aspen Music Festival and School. Ms. Toy plays on a viola that was built for her by Gabrielle Kundert in 2015. Outside of music, Sarah enjoys spending time with her two dogs, Quixote and Tamino.